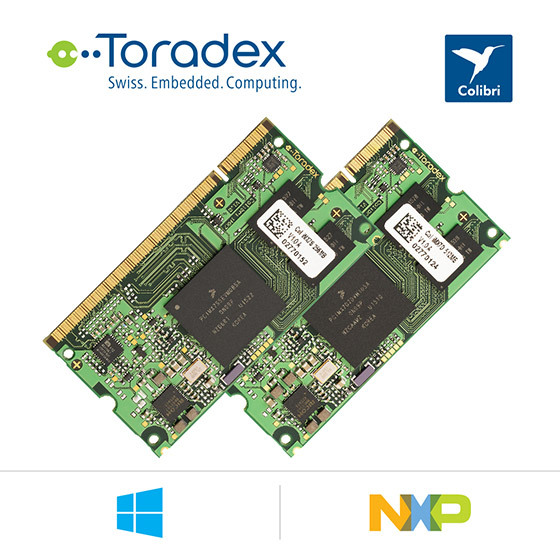 08 Dec 2016, Horw, Switzerland: Toradex is pleased to announce the support of Windows Embedded Compact 2013 (WEC2013) and Windows Embedded Compact 7 (WEC7), on its new Colibri iMX7 - a NXP® i.MX 7 processor-based System on Module (SoM). A preview WinCE OS image is available for download immediately at the Toradex Developer Center. This first software version includes initial support for USB Host, USB Device, USB OTG, UART, Ethernet, SD Card, and Display. Toradex will extend the features of the Board Support Package (BSP) in Q1 2017 and will work on a full production quality BSP like the one available on all other Colibri Computer Modules. The Colibri iMX7 comes with a free Windows Embedded Compact 2013 and 7 license. This release allows you to use WinCE on embedded computers with some of the latest SoCs available in the market. NXP’s i.MX 7 is optimized for maximum power efficiency and its single or dual core ARM® Cortex-A7 are clocked with up to 1GHz for excellent performance. The Cortex-M4 microcontroller core allows you to offload critical real-time tasks and optimize power, when the Cortex-A7 is not required. Connectivity: Ethernet, USB, I2C, UART, SPI, CAN, Analog Inputs, etc. The asymmetric heterogeneous multicore architecture enables to simultaneously run a Real-Time Operating System (RTOS) such as FreeRTOS on the Cortex-M4, and a feature-rich OS such as Linux, or WinCE on the Cortex-A7. This architecture is ideal for building power-efficient applications, without compromising on features and end-user experience. Additionally, to the Windows Embedded Compact, Toradex also provides a Yocto™ Compatible Embedded Linux BSP. For WEC, Linux and FreeRTOS™, Toradex provides free support. Other operating systems such as INTEGRITY™ or QNX™ are supported via the Toradex Partner Network. Toradex partnered with The Qt Company® to have their Framework optimized for the i.MX 7, the improvements are available in Qt 5.7 or newer. Toradex also currently provides a Technical Preview for Windows® 10 IoT Core on selected SoMs. Speaking on the occasion, Roman Schnarwiler, CTO, Toradex mentioned “Windows Embedded Compact is a great operating system, and we still see a large demand. As one of the remaining few companies worldwide which are still supporting WinCE, Toradex is committed to providing the highest quality WinCE BSPs even on a new SoC like the i.MX 7. The Colibri iMX7 is a great addition to our product portfolio with a low-power, but still considerably high-performance envelope. The heterogeneous multicore architecture allows combining hard real-time functions with a rich operating system or also enables even lower power applications to run on the Cortex-M4 core only, while the Cortex-A7 core is turned off”. For more information about the Windows Embedded Compact on i.MX 7, please visit our Developer Center. For price and order information, please visit our webshop.